Denise Full (left) and Rebecca Anderson and sisters as well partners in their bookeeping firm. Both became fed up with working for others, and it was Rebecca who came up with the idea to partner. Rebecca Anderson, her shoes squishing the soaked carpet, moved quietly through the office. “How are we going to survive this?” Denise asked. For Rebecca, who has cleared several hurdles on her way to owning her own business, ‘this’ Great Flood of 2010 that nearly drowned their Bellevue business along Coley Davis Road was her greatest challenge yet. Anderson isn’t immune to doubt but boasts a resilient nature and strong work ethic that she says was instilled in both sisters by their father, Wesley Dillard, a longtime corporate accountant in their hometown of Hendersonville. In addition to the tax and bookkeeping work he did out of his house – which he introduced to his daughters with ledger pads and checkbooks – he brought something unique to the table. However, even with their father’s encouragement to do whatever they wanted, the sisters struggled for years before launching Custom Fit when both were in their forties. Having a child at 19, Anderson had to “step up and take care of things.” She recalled during those days her father’s notion that being a woman was not a weakness. She avoided the temptation of government assistance and got a job. “I was thinking of going back to school, but with a job and a small child I never could make that work,” she says. The cost of education was too high, as well. Anderson, now 48, says it took a long time to establish herself in the business as tax preparer, bookkeeper or financial consultant. She spent 15 years at a company that wanted to hire a proven manager but hired her instead with the goal of learning how to be a manager. Then, of course, there’s the gender quotient. Full’s first job was “an eye-opener” when she was told there were things she couldn’t do because she was female. Fortunately, she got to meet the one person who likely put the sisters on the path to owning their own business – Sheryl Rainey. In time, the sisters grew tired of constantly having to prove themselves. By 2006, Full was embroiled in marital problems – her husband was in Iraq – and job issues had forced her to work mostly from home. She held tight to lessons learned from her father and from Rainey, but she was in a tough situation. It was August 2006, and they were in their early-to-mid 40s. 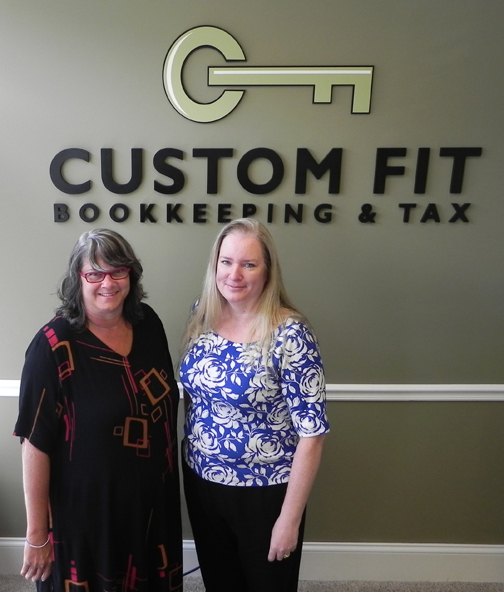 Anderson helped set up Custom Fit out of her sister’s house, and by March 2007 the business had grown so much that had she gave her notice and the business partnership was born. While Anderson says she made the decision to leave her job for her sister, she also had hit the ‘glass ceiling’ at her company. Custom Fit’s name comes from the company’s goal to tailor its services to each client’s needs, but it also describes the partnership. Anderson doesn’t like networking and marketing responsibilities; Full does. Full couldn’t “do a tax return to save my life;” Anderson loves crunching numbers. Both agreed, however, that they wanted the business to be different from the start. The staff has grown to six full-time employees, plus a part-timer (their dad), with a seventh to be hired soon. One goal was to add a new employee each year, and even with the flood, they are on target with that. Another is to add services, and fraud detection and business consulting will join the list of Custom Fit services. While it is hard to imagine, the flood of 2010 may have been good for business. The flood made them think more about balancing work and home life, too. Full says finding personal time is hard when you get so focused on day-to-day business responsibilities. She’s aware that when she attends networking events it’s partly to grow the business, but also it allows her the chance to interact with people. She worries though that being a strong businesswoman may make her less approachable. “Being a strong female entrepreneur does shut some doors,” she explains. Still, she and her sister view that as just one more challenge to overcome. “Being a busy owner is not as easy as it looks. It takes a lot of persistence, a lot of determination, and a lot of hours. It’s not for the weak at heart,” Anderson says.